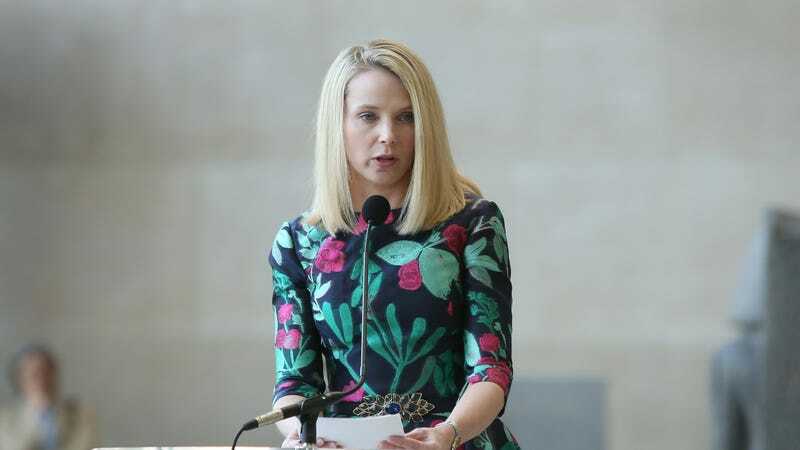 Yahoo CEO Marissa Mayer continues to stack up piles of cash, despite her veritable failure to rescue the company from a pile of its own rot. After numerous setbacks, including two massive security breaches and dwindling ad revenue, Mayer is set to make about $186 million as a result of the company’s sale to Verizon, new SEC documents show. This enormous sum of money—the actual transfer of which is contingent upon shareholder approval, a move the New York Times described as “widely expected”— includes shares she already owned, outstanding share options, a $23 million “golden parachute,” cash payments, and medical benefits, according to the documents. Of course, we’ll always have her Zamboni ride, as well as an absurdly extravagant and incredibly tone-deaf roaring ‘20s themed holiday party. Here’s hoping the next person who fucks up this badly isn’t rewarded with a nearly two hundred million dollar payout.